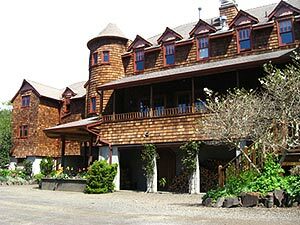 (Oregon Coast) - A few years back, I was startled to discover there was a castle on Oregon's coast. I thought I knew everything really interesting about the region - touristy or not. This not only shook my ego, but rocked my world. And so began a slight obsession with one spot on the Oregon coast: I wound up staying in this Cannon Beach-area legend numerous times. It's called Arch Cape House, and it's a charmer. The most recent tale begins on a particularly lovely day in early April, where I’m still getting used to the sun being out later, after the change in daylight hours. I hit the Oregon coast on this sunny, rather warm spring day – where it’s actually warmer than inland, in Portland. I should be working, with lots to do for this publication. But on days like this, with little or no winds on the beaches and the sun gleaming on every bit of ocean you can possibly see, I find it impossible to concentrate. I make a stop at Dragonfire Gallery and Studio in Cannon Beach on an errand, but find myself mesmerized by the vast array of colorful, inspired and even whimsical artworks that seem alive on these bright, fanciful walls. There’s a lilting, fascinating world in every one of these selections: from fantasy paintings, works of introspection, quirky creations with a sense of humor and many inventive objects that make you marvel at the imaginations that conjured them. 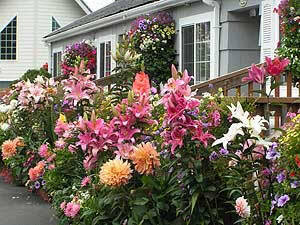 123 S. Hemlock St., Cannon Beach. www.dragonfirestudio.com. 503-436-1533. It’s almost six p.m., and the sun is still beaming strong. 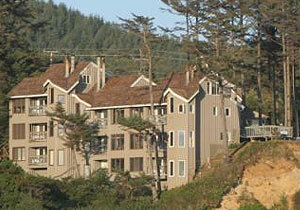 I finally make it to my evening’s stay: a castle-like building called Arch Cape House, just south of Cannon Beach. On approach, and from the highway, you see this beautiful, cedar-shingled B&B in the shape of a castle or Swiss ski lodge (and a little reminiscent of the Oregon ski lodge used in the movie “The Shining.”) It’s grandiose and striking, with a tower soaring up from the main entrance and the giant, slightly gothic, wooden door. Inside, it’s rather jaw dropping, with a giant chandelier over the white living room, and a lovely white fireplace at the center. Part of the tower descends through here, creating a little roundish space in one corner that serves as a sort of game room. I’ve been to Arch Cape House several times before, but always missed one rather interesting specimen of its many, many endearing features: the wine social hour in that cushy, beautiful living room. I actually just stumbled into this, catching owners Bob and Barbara chatting with a couple from Minnesota over glasses of white wine. What a nifty little way to spend your early evening. The pair, John and Lee, were loads of fun to gab with. I sat and spouted off about my favorite subject – the Oregon coast. They talked about Minnesota and the Midwest, and queried about economics and such in Oregon. I was starving by this time, and ready to pass out. I made a beeline for a new place just a few miles south: Guido’s Ristorante, in Wheeler. I’d suggested to the Minnesota couple they should eat there earlier, and sure enough, I found them there by the time I arrived. On top of their fabulous, rather cutting edge pizzas, Guido’s recently started doing pasta, which I inhaled with great joy. I am, admittedly, a serious regular here, as are many locals and regulars to this area. The staff is a kick in the pants; always amusing in a “Seinfeld” kind of way. The food is a must-see – plus the sunset view of the bay is unforgettable. THE TIDES BY THE SEA, Seaside. For over 80 years, The Tides has been a favorite of Seaside visitors. There's a sense of history as well as modern luxury here, with the ancient-looking stone walls and pillars out front practically screaming to tell tales of the generations of visitors that have stayed here. 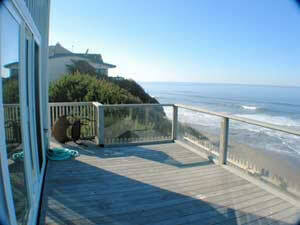 These 51 oceanfront condos come in various incarnations and are individually owned and decorated. 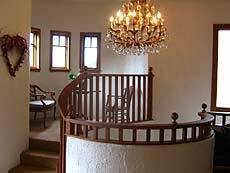 Find suites for couples, small apartments with fireplaces and kitchenettes, one or two bedroom family units with fireplaces, kitchens and dining rooms. 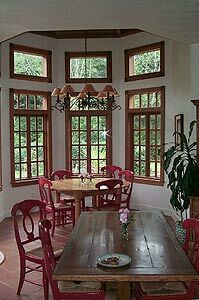 There are wonderful oceanview cottages that sleep anywhere from two to eight people, with two bedrooms, some with lofts, fireplaces and kitchens. John and Lee agreed with me and loved the grub as well. I love it when I’m right. Hwy 101, Wheeler. 503-368-7778. After goofing around the beaches well into the middle of the night with a pal from Cannon Beach, I retire to a comely room called the “tapestry” room at Arch Cape House, which gives you a feeling of sleeping in a rose garden with the red rose-like shapes covering the walls. Other rooms have cozy Jacuzzi tubs, little nooks for reading (or cuddling…or whatever inspires a couple staying here) and at least partial ocean views that are thrilling. Arch Cape House screams romantic getaway at the top of its lungs. In the morning, Barbara plays the culinary mad scientist and rustles up breakfasts that can only be described as genius. On this particular a.m., she made this fluffy, cheese omelets-like masterpiece that was indeed memorable. Perhaps most incredible was an enormous mushroom stuffed with a delicately layered sausage. I was entranced. Everyone at the table – John, Lee and a couple from Vancouver, Washington – were especially enamored of Barbara’s homemade bread. I could understand why, but was too busy floating in ecstasy from the omelet, sausage and mushroom to pay as much attention to that as the others. On this morning, the sun was spectacular, and the beaches seemed especially animate with bright blue water broken by pristine white breakers. At one point, I sat in the Arch Cape House garden and simply hung out with Bob, talking about our usual favorite subject – Internet marketing – and getting all geeky and nerdy (we’re a couple steps away from needing pocket protectors when we get together). Later in the day, I scarf down enormous amounts of what could be my favorite pasta all time: the penne pasta and meat sauce at Cannon Beach Fultano’s Pizza. This is one magnificent dish, with a glorious, multi-layered stream of flavors throughout the sauce. This, too, is a must-taste if you’re exploring Oregon’s north coast. They not only feature innovative pizzas, but they deliver them too. 200 N. Hemlock and Second Street. (503) 436-9717. Arch Cape House provides weddings in their unique little garden area – which will get even more charming as now-Master Gardener Bob is getting his green thumbs even browner these days. 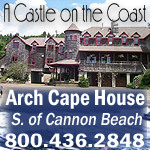 Arch Cape House is on East Ocean Rd., just north of the Arch Cape Tunnel. www.archcapehouse.com. 800-436-2848.